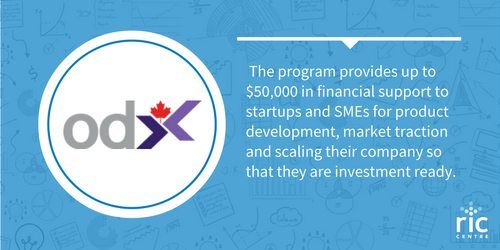 The ODX Ventures program supports Ontario based businesses who use open data in their product or service. Successful applicants must be willing to provide an in-kind match to the amount awarded. How is the money applied? A non-repayable contribution of up to $50,000 will be applied towards the successful application. The contribution will come in the form of resources and professional services to help in the product and commercial development of the company to get them to the next level. The successful Applicant company must match the contribution in a minimum of a 1:1 ratio with eligible in-kind contributions. Strong preference is given to applications that have shown proof of market traction through third-party investment and/or customer sales. Applicants have the option of including term sheets, customer purchase orders, or other relevant documentation to strengthen their application for funding. A condition for the release of resources and professional services will require the company to provide a detailed project budget and to report on matching of eligible in-kind contributions on a minimum of a 1:1 basis to the funds obtained. Eligible and in-eligible in-kind contributions will be outlined and need to be reported as part of the Collaboration Agreement that needs to be signed with the Open Data Exchange. Applicants must enter into a collaboration agreement with the Open Data Exchange and be subject to project and reporting as outlined below. Start-ups/SMEs must account for all funding currently in place. Startups/SMEs that have over $50,000 in active funded projects must complete those projects (including all final reporting) prior to ODX Ventures considering other applications for funding. Start-ups/SMEs be endorsed by a Campus Linked Accelerator (CLA), Regional Innovation Centre (RIC), On-Campus Entrepreneurship Activities (OCEA), or hubs in the CDMN network. Wait a second, what is Open Data? Open data is data produced by the government that can be freely used, re-used and redistributed by anyone. The data can be from any level of government from municipal, to provincial, to federal. Perhaps the best know example of Open Data is Census Data from Statistics Canada. However, Open Data extends to multiple sources from Weather Data, to Education Data, to Traffic Data, to Real Estate Data. The possibilities are endless. How is your business using Open Data and how can ODX help you? After the application deadline, applications will be reviewed for completeness, eligibility, use of funds, ability to demonstrate a viable business proposal using Open Data, and the impact the project will have on your company’s business growth. The applications will be evaluated by the Open Data Exchange Advisory Board who will make its recommendations to the Open Data Exchange. The Open Data Exchange will make the final decision and notify the successful applicants.